The Clock, an extraordinary new film showing at the White Cube gallery in London, consists of thousands of old movie clips in which a clock features or where someone refers to the time, as the BBC's art correspondent Vincent Dowd reports. Going to The Clock with a movie buff could get very aggravating very quickly if they tried to name every clip. The director, Christian Marclay, says there are at least 3,000 movies clipped in it. But there is no exact listing and the count may be closer to 5,000. Mr Marclay is in his mid-50s. He is US-born but was raised in Switzerland and now lives mainly in London. He makes montages of video and audio. Among the best-known is Video Quartet, which shows a strip of four panels playing simultaneous clips of music from films. Together, the videos make a single, original piece of music. That film lasted 14 minutes. The Clock is a very different experience and one that is raising a lot of interest. Imagine walking into a cinema and sinking into a comfortable sofa. The film runs for 24 hours so you can go any time of day or night. Perhaps being there at night increases the dream-like aspect of a piece consisting of endless clips of other films - from forgotten 1930s thrillers to recent blockbusters. A few sequences run a minute or so, but most are shorter and sometimes clips are made of a single shot. Every sequence has a clock or a watch in it or a character making a reference to the time of day. The movie is synched to local time so if the clock on screen shows 3.38pm then that is the time where you are. And three minutes later there is a clip on screen where it is 3.41pm (so you can leave your watch at home). Some viewers like to detect new stories emerging while others enjoy The Clock's very lack of traditional narrative. The editing is superb, both in sound and pictures. "But when you're editing a piece that's 24 hours long, it's going to take several years. I kept postponing that moment when I had to sit at the computer," Mr Marclay says. "Eventually I hired assistants to watch films. Every time they saw a clock or spotted a time reference in the narrative they brought me the footage. Image caption Mr Marclay describes his piece as "celebratory of cinema"
"And then, of course, someone would bring me footage with that exact time but more interesting - so I'd have to re-edit. "The hardest hour to fill was 5am to 5.30am. But people dream a lot then so I used a lot of dream sequences," he adds. He says he tried to create the illusion of continuity, where "the action flows from one narrative to the next". "Sometimes you get fooled because the mind just accepts the edit." "I see the piece as a giant memento mori (reminder of mortality). Perhaps that's why I embarked on it - because I turned 50. Maybe I'm having a mid-life crisis and thinking about time and how little time is left. But everybody relates to it because we're all anxious about time going by." Yet Marclay acknowledges a paradox. "I was at the White Cube gallery and watched people come out after they'd spent an hour or two inside. Even though it's dark subject matter everybody had a smile on their face. "Anyone can relate to it. You don't have to understand contemporary art. You don't have to be intimidated by it. The attraction of film is so seductive." As for how Mr Marclay cleared the rights for up to 5,000 films, many controlled by major distributors - he didn't. "I'm not interested in that debate so much. My work is so celebratory of cinema that you want to go and see these films. It's the best publicity for the film industry." 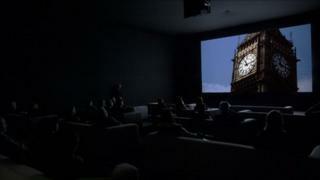 The Clock is at the White Cube gallery in London SW1 until 13th November, with 24-hour screenings Thursday to Saturday. It also plays as part of the British Art Show - currently in Nottingham and then touring.